It used to go like this: you go to school, you get good grades, you graduate from college, you get a good job and then you live happily ever after. The End. In 2009, however, it goes something like this: you go to school, you get good grades, you graduate from college, and then you take a number and go stand in the unemployment line like everybody else. It really doesn't seem to make much difference whether you graduated from Harvard Law School or from Fair East Side High School, people are out there losing jobs like cats on Top Chef. However, let's keep it one-hunid for a minute: during this 2009 recession, there appear to be a lot of UNequal opportunity employers out there. What I mean by that is, if you should ever happen to find yourself down at the unemployment line, as I have, when you take a look around to see who is standing next to you, you can't help but notice that although it may not matter where you graduated from, it certainly does seem to matter what kind of pigmentation your skin has. But don't take my word for it; let's take a look at the numbers. This week, the Department of Labor Statistics released the job loss numbers for November: a net of 11,000 Americans lost their jobs, bringing the total number to 15.4 Million Americans who have lost their jobs since the start of this recession. The unemployment rate for November was 10%. Historically that number has always been around 5%, or half of where it is now. Under Clinton's second term as President for example, the unemployment rate was 4.3%. When compared to 4.3%, 10% unemployment looks pretty bad. But none of that even begins to hold a candle to the rate among college-aged folks in the Black Community right now, where unemployment sits at an officially ridiculous 34.5% (thirty-four point five percent)!!! 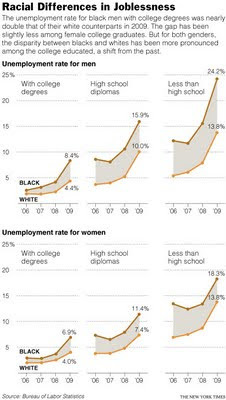 The New York Times recently did an interesting piece where they broke down the stats of unemployment by race, college education, and gender (see graph below). What the article reveals is troubling: many Black college graduates are removing all items from their resumes that could possibly identify them as Black. The reason is simple: Black applicants are not getting interviews. Even though it is a damn shame that it has come down to this for Black college degree holders, especially those from HBCU's, the facts actually support their actions: Black college grads are unemployed at TWICE the rate as their White counterparts. As far as the folks interviewed in the NY Times article are concerned, it is time for Black people to revise those resumes if they want a job. Black Student Union? - Gone! Black Law Students Association? - Deleted. NAACP member? - sorry, that's a typo, it should say NCAA member...gotta love March Madness! Go Hawks! "Various academic studies have confirmed that black job seekers have a harder time than whites. A study published several years ago in The American Economic Review titled “Are Emily and Greg More Employable than Lakisha and Jamal?” found that applicants with black-sounding names received 50 percent fewer callbacks than those with white-sounding names." In this so-called post-racial America that we live in, many people are actually shocked to find out that the racial issues that have been plaguing this country for 200 years did not somehow culminate with the election of President Obama. I can't say that I am one of them. However, what I do find troubling is this: post-racial America or no post-racial America, when the stuff hits the fan and jobs start getting cut, Black folks might as well be starring in a horror movie because they're the first to go. Question #1: Why is that? The article [is] surprising only for the extent to which the author and the interviewees think the subject should be surprising. Inevitable is the appropriate term. 1. HBCU curricula is weaker and the standards for admission and graduation lower than for mainstream colleges and universities. 2. Blacks who are admitted to and graduate from mainstream institutions are able to do so with a boost from equal opportunity and affirmative action that endows them with a substandard education. 3. Decades of entitlements have ill-prepared blacks for a world in which privilege must be earned. 4. Blacks insist upon maintaining their ethnic identity in dress, speech, and behavior. 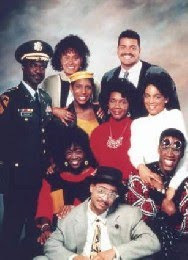 Employers recognize, but blacks do not, that the employee is the representative of the company. 5. Black parents, in a short-sighted fervor of racial identify [sic], have handicapped their children with race-identifying names that enable an employer to ignore a resume without fear of being charged with bias. 6. A disproportionate number of blacks, males especially, have a criminal background. The solutions are simple but tough: Close every HBCU; cancel every program that grants preference because of race; and make admission, grading, and graduation standards uniform for everyone. These apply to 1 – 3 above. Numbers 4 – 6 are the responsibility of black parents, the students themselves, the NAACP, and Jesse Jackson. Two generations must pass in order to see results. A long time, yes, but if these steps had been taken two generations ago, this article would not have been written. Question #2: Is he Right or Wrong?